water, glowing in June and July. Length, around 12 to 18 mm. The heike-botaru firefly is smaller, at about 8 to 10 mm. At the water's edge, greenish-white specks of light dart about in the dark night air. Fireflies have made early summer a special time for the Japanese since ancient days. 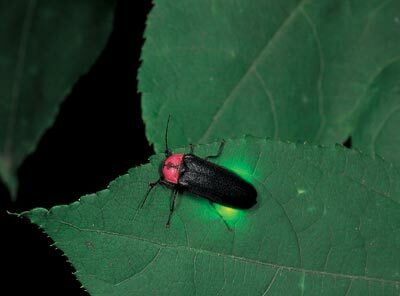 The Japanese word for firefly, hotaru, is generally used for two species, genji-botaru and heike-botaru. In their larva form, both species prey on small freshwater snails. Genji-botaru larvae live in clean flowing water, heike-botaru in rice fields and other places where water is stagnant. There are about 2,000 firefly species in the world, but fewer than 10 species are known to be aquatic at the larva stage. All of the others are terrestrial at both the larva and adult stages, making the genji and heike species very unusual. The Japanese archipelago has plenty of rivers, streams, wetlands and irrigated rice fields, and these provide excellent habitats for aquatic fireflies. So it is natural that, since ancient times, people in villages and towns have observed and enjoyed the little lights darting about in the night. Fireflies first appear in literature in the Man'yoshu, Japan's oldest collection of poetry (late 8th century). They appear in haiku, longer poems and essays right through to the Edo period (1603-1867). In the old days, there was a belief that the lights of fireflies represented the souls of the dead. In the Edo period, one pastime was catching fireflies while enjoying the cool evening air. Ukiyoe woodblock prints show things used to catch them, such as flat and folding fans, traps made of bamboo grass, and insect nets. This custom seems to have developed in the mid-1600s in the Seta and Ishiyama districts of Otsu (present-day Shiga Prefecture). When the light show was at its peak in early summer, hotaru-bune boats would take people on eating and drinking excursions to the best places to see them. This was common in Seta, and in Uji in the Kyoto suburbs. Hawkers even sold fireflies there, but this type of "business" was still unusual in Japan. By the end of the 1700s, fireflies were also being sold in Edo (present-day Tokyo). Pleasure-seekers gathered at viewing spots in different parts of the city, but the number of fireflies dropped as the city expanded. As time went on, indiscriminate hunting by firefly sellers led to fears that the genji firefly was endangered, and in 1924 the national government designated the Moriyama district in Shiga Prefecture a protected habitat for them. Today, one habitat has been registered as a Special Natural Monument, and nine as Natural Monuments. Japan is probably the only country in the world to have implemented legislation protecting fireflies. But this is not surprising, because the little beetles have long held the affection of the Japanesein some places they are called by pet names, and catching fireflies is a fairly common theme in old nursery songs still heard today. The economic boom times that began in the 1960s were hard on the natural environment, and firefly habitat, once common throughout the country, quickly shrank in area. Urban development, water pollution, riverbed alterations and the construction of dykes for flood prevention were the main causes of this loss of habitat. In some parts of Japan today, local governments and citizens are protecting and restoring firefly habitats, and even developing new ones. When necessary, snails and other firefly prey are bred and released there. Today, one popular pastime is observing the winged insects emerge from their pupa coverings. In the old days people caught them for fun, while now we watch and learn about them. To protect them is to preserve the natural world they live in, so their bright lights have come to symbolize a healthy environment. The affinity Japanese people have had for fireflies since ancient times is still strong today, and as a national social phenomenon, it is probably unique in the world.